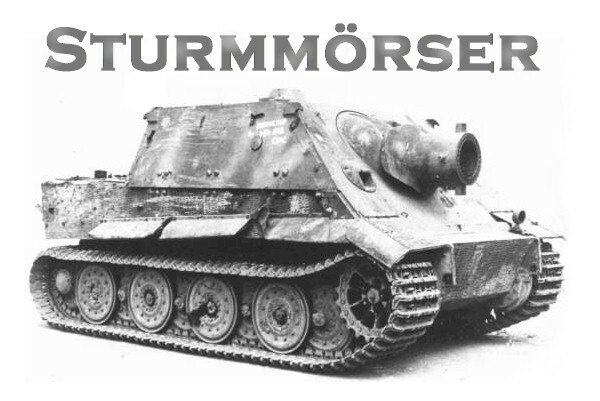 Sturmmörser also referred to as Sturmtiger was a self-propelled assault mortar on a tiger 1 chassis. It fired a 38 cm rocket propelled shell, was heavily armored and as a result weighed in at about 68 tons. In 1943 Alkett was contracted to produce a self-propelled mortar that would mount a 38 cm Mortar in a Tiger chassis. On October of that year Hitler was shown the prototype Panzermörser mit 38 cm auf Tiger I. Three Sturmmörser were completed in August 1944, with an additional 10 in September and a final 5 in December for a total of 18. The Sturmtigers were originally organized into companies of 4 Sturmtiger each. Later they would be transferred from the Panzertruppen to the Artillery and organized into batteries. Shortly after that their number would be increased from 4 to six per battery. They would initially see service in Warsaw and Hungary in 1944 but their activities would mostly be limited to the West.